Tea, including black tea, is the second-most consumed beverage in the world, according to the Linus Pauling Institute, second only to water. Primarily known for its stimulating effects and promotion of mental alertness, black tea also has other potential health benefits. Drinking black tea is relatively safe, but consult your doctor first if you are pregnant, ill or taking medications. Black Tea is made from the leaves of the same plant, Camellia sinensis, as oolong, white and green tea. It is considered a "true tea," differentiating it from the "tea" made from other herbs or plants. Black tea leaves are prepared by breaking the leaves or rolling them, which allows them to fully oxidize -- a process that involves oxygen interacting with the leaves to produce the necessary active ingredients. The oxidation process -- often mistakenly referred to as fermentation in the tea business -- is the longest of all the four "true teas" and produces the greatest amount of caffeine of any in the group, as well as beneficial antioxidants known as theaflavins and thearubigins. The oxidation process also turns the leaves a darker color. Widely recognized as a mental stimulant, black tea is also recognized for its other potential health benefits, primarily because of its caffeine and antioxidant content. Black tea also contains enough fluoride to possibly help prevent dental carries, according to the Linus Pauling Institute. Black tea can help prevent orthostatic hypertension -- dizziness caused by standing too quickly -- and is possibly effective for reducing the risk of heart attacks, atherosclerosis, kidney stones, Parkinson's disease and ovarian cancer. Research for other types of cancer in animals suggests that black tea may have an effect in reducing the risk of certain cancers, such as prostate and lung cancer, but studies in humans have yielded mixed results. More research is needed for other supposed benefits, including those for osteoporosis, type 2 diabetes, tooth decay, high blood pressure and stomach disorders. Black tea is best prepared by bringing fresh, unused water to a roiling boil. Pour 6 to 8 ounces of the boiled water over 1 to 2 teaspoons of dried black tea leaves or one prepared bag of tea leaves. Steep the infusion for 3 to 5 minutes, making sure not to over steep it, as that can make the tea taste bitter. Adding milk is an option, but it may reduce the beneficial effects of the black tea, according to Medline Plus. Be aware that an eight-ounce cup of black tea contains approximately 40 to 120 milligrams of caffeine, which is about 30 percent of the average cup of coffee. 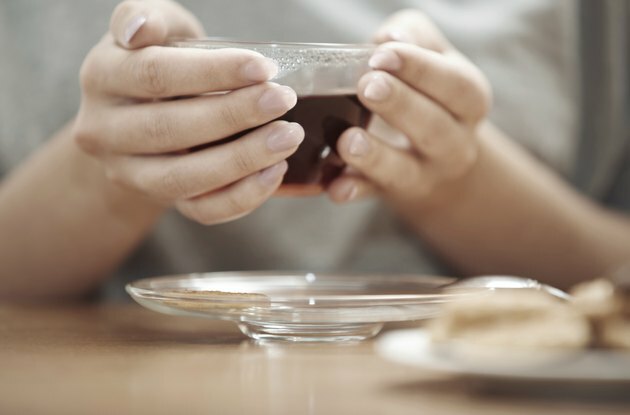 Black tea is safe for most people, even in large amounts, according to the Linus Pauling Institute. However, if you have a chronic health issue, such as anemia or irritable bowel system, the caffeine in black tea may exacerbate your condition. Consult your doctor or a qualified health practitioner before consuming black tea, if you are taking any medications or supplements -- particularly stimulants -- or, if you are pregnant,as there is some indication that pregnant women should not consume more than two cups of black tea a day. What Are the Benefits of Camellia Tea?